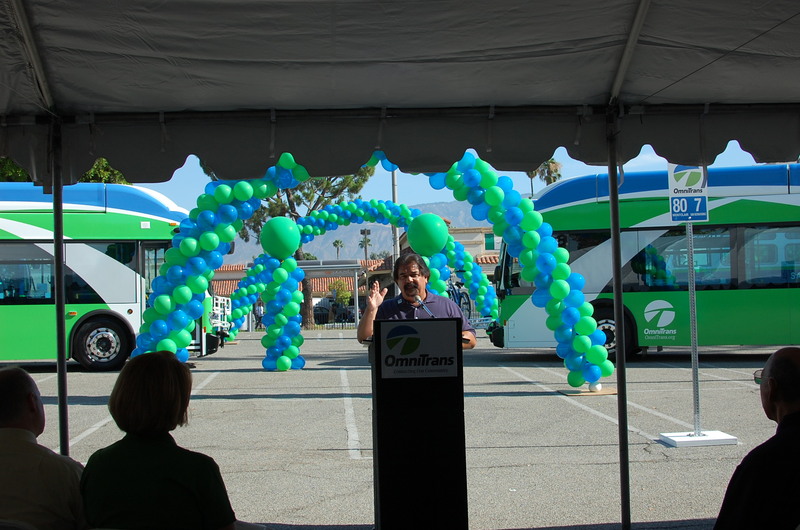 San Bernardino, CA –Omnitrans unveiled its new logo, slogan and fleet graphics on Wednesday, August 15th at the transit agency’s main transfer center in downtown San Bernardino. The agency website, www.omnitrans.org, also got a makeover. Smart phone and tablet users can now instantly access maps and schedule information without cumbersome downloads or continuous scrolling. Important news and updates are prominently featured up front. The easy-to-use trip planner appears on every page. Drop-down menus allow the user to easily search information by service, route or destination. Fare information is available at the touch of a button, and passes can be purchased online. New buses also feature 3-capacity bike racks, an upgrade from the 2-capacity racks on the existing fleet. Omnitrans transports over 300,000 bikes each year. To spotlight the new racks, Omnitrans held a “Rack and Roll” contest at the event. Contestants were timed loading a bike on to the rack. Al Langdon of Rialto had the fastest time and won a new bicycle courtesy of Performance Bicycles in Ontario, California. Buster, the agency mascot was also updated with the new fleet graphics. The new logo and color scheme replace designs developed in 1985 and are the third logo and branding used by the transit agency in its 36-year history. 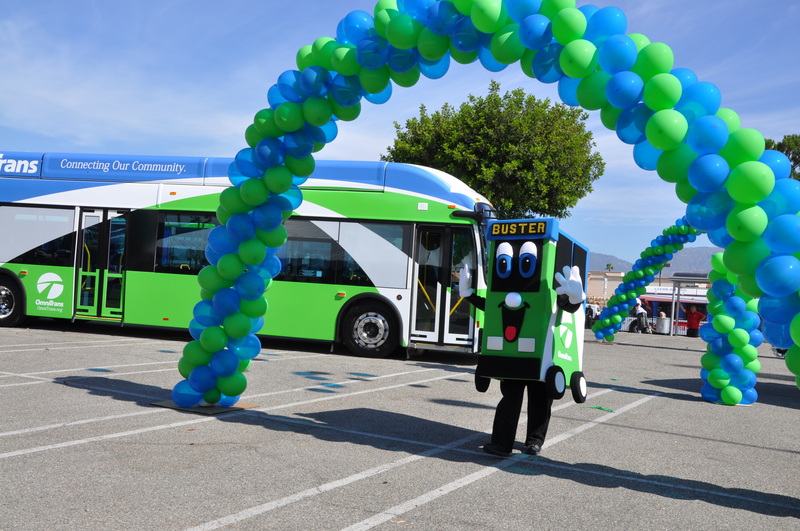 Founded in 1976, Omnitrans is the public transit agency providing over 50,000 passenger trips each weekday across the San Bernardino Valley. 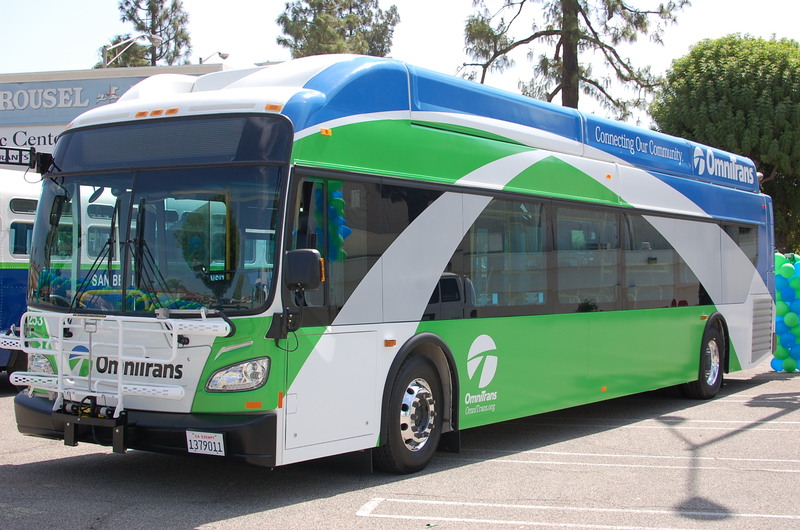 Omnitrans is governed by a 20-member board representing the 15 cities served by Omnitrans and San Bernardino County. This entry was posted in Events and tagged omnitrans bike contest, omnitrans ceo milo victoria, omnitrans new buses, omnitrans new flyer xcelsior, omnitrans new mascot, omnitrans news, omnitrans rebrand, omnitrans rebranding event. Bookmark the permalink.